Lost in all the excitement of Ben Roethlisberger's comeback and Ike Taylor's amateur boxing match on Saturday night was another interesting storyline: Dan Rooney got kicked out of the press box at New Meadowlands Stadium. Ed Bouchette reported yesterday that the Steeler Owner and U.S. Ambassador to Ireland, who flew in for the game, was in fact asked to leave the press box on Saturday night during the Steelers-Giants preseason contest because he did not have the proper credentials. The 78-year-old Hall of Famer did not pull a "don't you know who I am" card, he merely left the area with no protest. Rooney, who has made a habit of visiting the press box over the years to talk with writers, was ordered out of the area and back to his seat in a private box by a Giants staffer. Bouchette believes it is the first time Rooney has been asked to leave a press box, an area which typically houses much more than media personnel. Of all the opponents for this to happen against, it's interesting that it came against the Giants. The Rooney and Mara families were eventually united via the marriage of Giants VP of Player Evaluation Tim Mara to Kathleen McNulty (née Rooney), and that union resulted in the actresses you now know as Kate Mara (below left) and the appropriately-named Rooney Mara (below right). Kate Mara's acting resume includes such films as Shooter, We are Marshall, Iron Man 2, and 24. 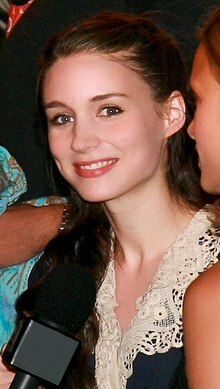 Rooney Mara, 25, has been seen in such films as Youth in Revolt and A Nightmare of Elm Street. She was recently cast in the plum role of Lisbeth Salander, the lead in David Fincher's The Girl with the Dragon Tattoo, the first of three Sony Pictures films based on Stieg Larsson’s Millennium Trilogy book series. What a disgrace. A slap in the face to one of the most influential men in NFL history. Yeah, horrible about Dan and all. More importantly, can you post more pics of the Mara girls? Frequently? It was disappointing they didn't bring back Kate Mara on Entourage. More important than this story I think.